Placing a skip bin in Melbourne? Home » Placing a skip bin in Melbourne? 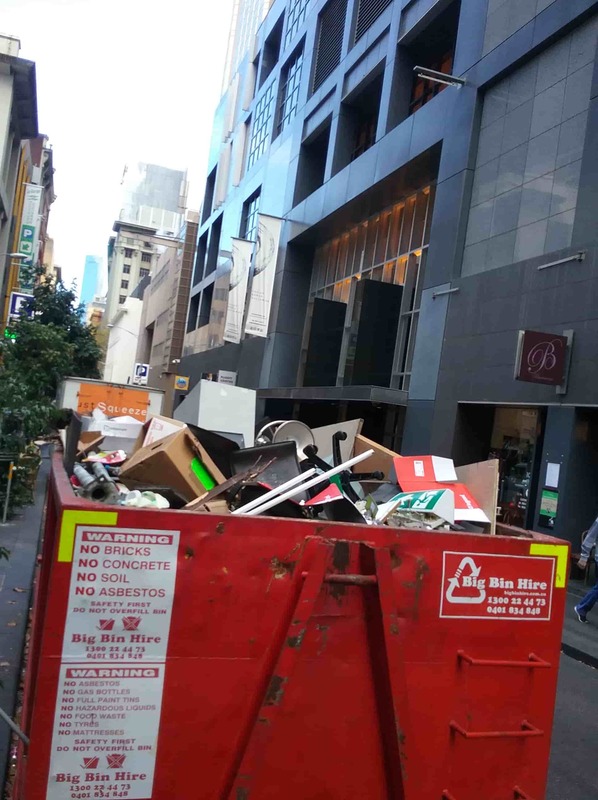 Big Bin Hire is regularly visiting the Melbourne CBD to place skip bins in the city for many of our customers. There is always a lot of work taking place in the city – such as defits; fitouts, commercial cleaning and general construction. Our skip bins are perfect for any light commercial demolition waste and general office and corporate clean ups. But there are a few things you need to know before you consider booking a skip bin for placement in the city. There are rules and regulations that the City of Melbourne stipulate and there a few guidelines we need to discuss with our customers prior to booking in a Melbourne city skip bin job. Like all jobs that involve hiring a skip bin, the location must be easily accessible to a truck. Maneuvering of a truck is not as simple as a car. A truck requires a large turning circle (say 5 metres) and usually requires the space to move where and when there is the least congestion. You will need to also consider overhead obstrucitons and allow for 5 metres height. This is how how a hook skip bin will need to lift up off the back of the truck. Overhanging trees, ceilings and the openings of loading bay entries must all be regulation height and offer not obstructions to the placement or picking up of the skip bin. Customers will need to consider the location in terms of the available space, proximity to buildings, landmarks and other restrictions that may impede the drop off and pick up of the skip bin. 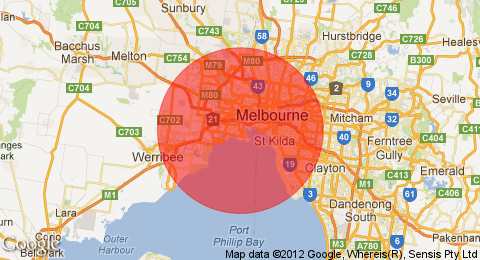 The Melbourne CBD can get very congested. We always recommend placing down and picking up our skip bins outside of peak hours and where possible, early in the morning and prior to the commencement of peak hour in the afternoon. It is important to discuss the timing when booking the skip bin because ideally you – the customer – will need to have somebody on site at the same time to ensure the placement and pick up goes smoothly. From time to time, traffic management by the customer is required to ensure that passing traffic (both pedestrians and vehicles) are not inhibited during the skip bin placement/pick up process. Melbourne City Council prefers that if a skip bin is to be placed on the road (which of course requires a permit), a loading zone is used. Under no circumstances can a skip bin be placed in a restricted parking bay or no standing zone. If a clearway is to be used; adherence to the clearway instructions is mandatory. Our skip bins range from 4-20m3. All of our skip bins will fit into a standard parking space. It is important to note however that the skip bin can not impede traffic or pedestrians. For example if placing a skip bin in a small road/lane, if there is a vehicle/obstruction opposite the skip bin at any stage that makes it impossible or difficult for traffic to pass then the Council will order for the skip bin to be moved. The friendly team at Big Bin Hire is always happy to discuss your skip bin requirements and determine a plan as to how the placement of your skip bin in Melbourne City can be seamless, ensuring your job gets done well and on time. Please call us on 1300 224 473 to discuss your skip bin requirements today.